Weezer are always doing innovative things with fans. They get them to finish half-written songs and bring instruments to live shows for school-hall sized jamming sessions. Now, with fans in tow, Weezer have set five new Guinness World Records while filming the video for latest single Troublemaker. The band are also vying for one more: playing the world's smallest drum kit. The Troublemaker video clearly shows sticksman Pat Wilson beating - and a Guinness official measuring - a very small set, but for unknown reasons the record has been denied. Still, they don't exactly go home empty handed. 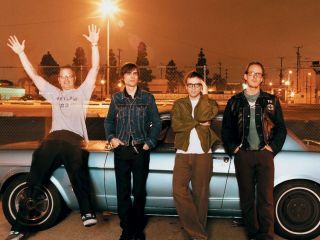 Weezer own: the Largest Air Guitar Ensemble (233 participants), the Largest Game Of Dodgeball (two teams of 50 people), the Longest Guitar Hero World Tour Marathon (lasting 10 hours 12 minutes 54 seconds), the Most People In A Custard Pie Fight (120) and the Most People Riding On A Skateboard (22). Phew. Perhaps the world's smallest drum kit record was denied because it's not actually the world's smallest drum kit. After all, these miniature replica sets do look pretty damn small.